Synopsis: Add flare to your interior! Ahh, the tachometer housing cover is the final note in the interior themed MINI you've been creating...or IS IT? 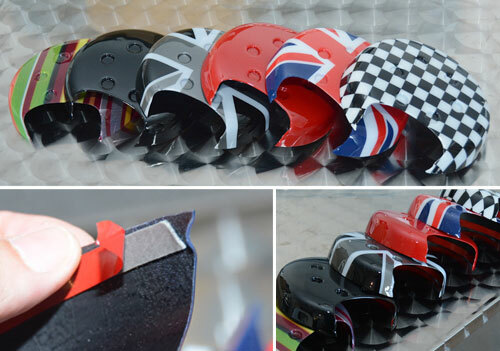 With new stuff coming out all the time this is likely not the last Union Jack, Checkered Flag, Red, Gloss Black, Paul Smith Stripes or Black Jack themed accent to install in your MINI. This is a simple install requiring little to no skill - ships with pre installed 3M double stick tape. Please note: there is a protective film that needs to be removed from the cover before being installed. Just start peeling back the thin film near the edge and you will see the translucent film start to come off. This product will require some minor trimming if the open meter is installed on the R57 Convertible or if you have installed Cravenspeed or other attachments to the back of the tachometer.